Creating a solid piece of content that contains relevant keywords is a critical part of your SEO strategy. It might sound obvious, but you’d be surprised how often this step is misunderstood as part of a recruitment website SEO strategy. It’s important to shape your content, which could be an ebook, a whitepaper, website pages, a blog or a social media post, for example, so it both delivers the results you are setting out to achieve while allowing you to target relevant keywords. The term 'keyword' most commonly refers to the words people use when they search. A keyword can be a single word or a phrase. There are many tools available such as Google’s free Keyword Planner, which can help build a list of keywords to be used in a campaign for SEO and content. Take a look at your own website and consider which words Google believes you rank for by logging into the adwords area. If you’ve never used this before, then this tool is highly effective in both driving free or paid for traffic (pay per click) to your site. Once you’ve built your list of keywords, you can start to target their position by producing content written with them in mind. Renew and review these every month - it may seem like a chore but it’s well worth the effort. These keywords are the bedrock of your content strategy. The next step is to build your SEO reputation. Establish which keywords have good volume but are not too competitive. Ideally, you want to target a keyword that has a relatively low search volume as opposed to keywords that are very popular. For example, there are usually more than twice as many searches for ‘oil and gas jobs’ versus ‘oil and gas careers’, so focusing your effort on the most popular search is probably not worth your time as you’ll struggle to score high in the rankings. Choosing a keyword that has a lower volume of traffic will help you achieve a better ranking for this word. The more keywords you rank for, the higher your site’s reputation becomes, which then means that you have a better chance of ranking for the associated higher keywords. 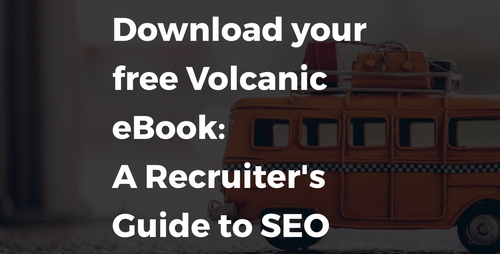 To learn more about keyword targeting, download our free Recruiter's Guide to SEO.